This week Instagram brought in changes to how people will be able to view posts, so we thought the time was finally right to unveil our newest page. Now you can see the last 3 Instagram posts from Hozier, each of the band members and ourselves in one handy spot. Bookmark this page and never miss another Instagram post. Also, we’ve updated our post on Raven, Hozier’s new Danelectro Guitar to include some specs and a few good photos. More on Hozier’s Gold Medal of Honorary Patronage Award from Trinity College Dublin. The Guardian analysed the list of all-time best selling singles and re-ranked them by streaming stats. Hozier’s Take Me To Chuch is #7 on the list of Spotify’s Top 20 Most-Streamed songs. The Cherry Wine video for Hozier’s #FaceUpToDomesticViolence campaign passed 4 million views on YouTube this week. Alex Ryan was back in studio with Saint Sister. We started the week with a chuckle when Anúna posted a blooper reel to YouTube. Speaking of senses of humour, April Fools’ Day brought this hilarious parody article on Hozier from the University of Wisconsin. Live From The Artist’s Den episode with Hozier will air this week, but it will not air on the same date in all regions. Although, the show’s website says “Starting April 8th” we have seen some mentions of people seeing it in their television listings on April 7th. In the USA the show airs on PBS. You can check your local public television listings here. 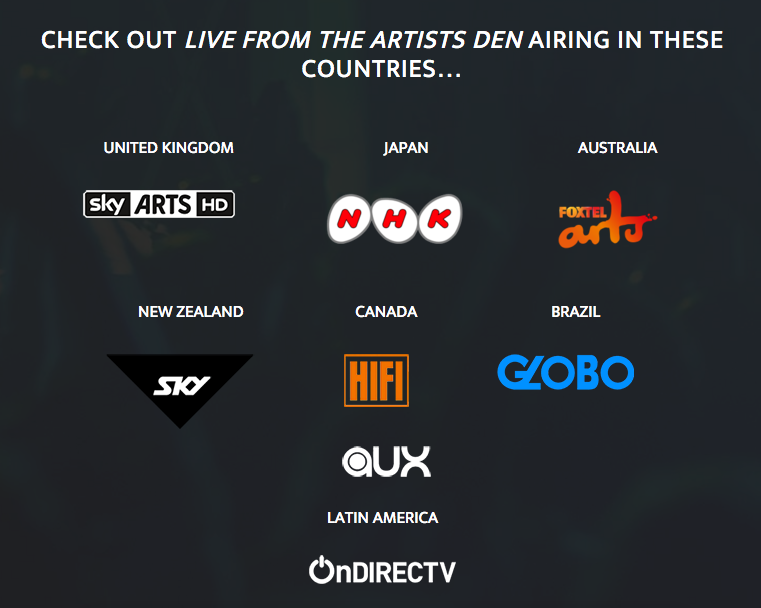 International viewers can check this link to see which channel might carry the show in your region. Hozier has been in Los Angeles all week. Alana Henderson is enjoying everyday life in Northern Ireland. Lorraine Barnes is on holiday in Spain. Mia Fitzgerald is back in Los Angeles. Rachael Lampa shared some great news! Rory Doyle picked up some tasty gear and was cooing over kittens. Little Green Cars are in the midst of their North American tour. Be sure you’re following them on Instagram, Twitter, Facebook, and especially their new Periscope as they share their journey. We're playing at @thestateroom tonight in #saltlakecity awfully pretty, with @johnmarknelson and his gorgeous band. Wyvern Lingo had a busy week. They performed a secret show in the hills above Dublin, that was recorded for Sofar Sounds, in advance of their sold out EP launch at The Button Factory. Check out photos from the night and post-gig antics from the band. Wyvern Lingo also released an interview offering in-depth insight into their song Subside and a fabulous behind-the-scenes style video for their song Running featuring footage from their three nights supporting Hozier in Brixton in January. Saint Sister are back in Kerry with Alex Ryan to record their second EP. They also released a stunning new video for their song, Blood Moon. Jarlath launched his album, Hearts Broken, Heads Turned this week. You can listen to and purchase the album on bandcamp. Alana Henderson provided vocals for tracks 7 and 8. Jess Kav’s band BARQ released their first video this week, also landing them on Spotify Ireland’s Viral 50 playlist. Thank you @WNYU Radio for picking up our track, 'Gentle Kind Of Lies'! In some lovely company with @Comeonlivelong and @GavinGlassMusic!